I know, I know, I could let some air out of my tires, get snow tires, ride slowly, and do fine on roads with some ice and snow remaining on them, but I could also just not ride the few days a year when there’s ice on the roads in Baltimore. Yeah, that’ll work, but I’m still not going to drive if I can help it, so I layered up and walked up and over to Waverly to meet O. and R. on Saturday. Yeah, I might rethink that decision next time, because the streets, especially the better-travelled ones, were mostly clear–wet, but not icy. The sidewalks, on the other hand, were treacherous ice sheets, glistening their evil eyes up at me as I made my way slowly and carefully, making sure of each footing before lifting another foot. The sidewalks were iced over because unlike the public property of the streets, sidewalks are the responsibility of individual homeowners, and apparently either individual homeowners don’t know that, or don’t care. The sidewalk in front of my house was iced up because I guess I was waiting for the landlord to deal with it. By the time I slid my way home that evening, though, I realized I had better remove enough ice for folks to pass easily. I chipped away, slowly but surely, and this morning it is starting to melt enough to make way. As I was chipping away, though, I wondered why we have individualized this particular collective infrastructral issue and not decided instead to spend our social wage to make easy passage for everyone, not just drivers. Because walking was truly dangerous yesterday, and how can it be that we make passage so dangerous, especially for those for whom walking is challenging in the first place? But hey, at least the roads are clear. 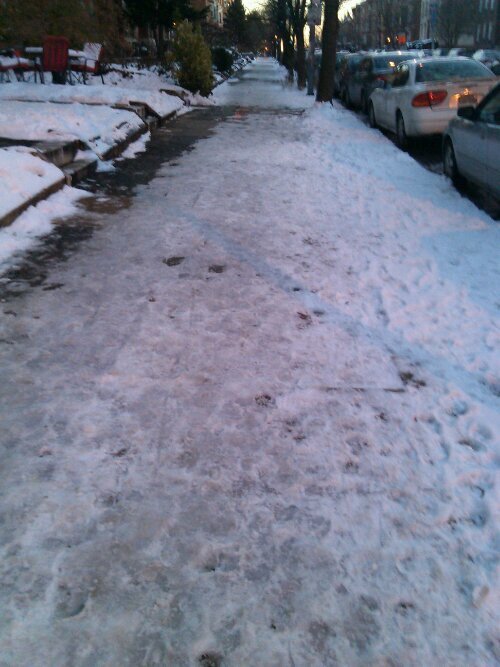 This entry was posted in infrastructure and tagged Charles Village, ice, sidewalks, snow, walking, Waverly, winter. Bookmark the permalink. There is always someone on the street that doesn’t shovel but then if it melts some and freezes back up, I’d rather walk on the snow where there is some traction. Boise’s snow is 75% gone and what’s left is from Nov. 30th. Dirty old snow…better stay home and watch Netflix.